Every wedding day is so different – what was the most memorable part of your wedding day for your and Steve? What moment of your wedding day did you most anticipate? I know you worked closely planning your wedding with your wedding planner, Kiersten. 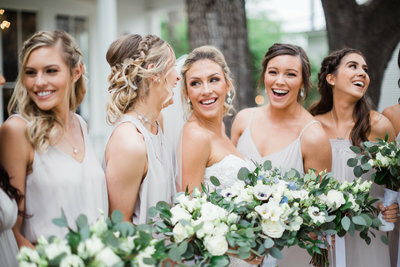 How did you come up with your overall wedding vibe? What were your favorite planning resources when looking for inspiration? I went crazy on Pinterest at the beginning! I created a wedding board and just started pinning everything I liked, which quickly got out of control. Over time I “curated” it a bit more once I started getting a better sense of my vision, and I even created sub-boards for certain elements like table decor, lighting, hair/makeup, wedding dresses, and bridesmaid dresses. These boards were helpful to share with my planner and specific vendors so we were on the same page. I also stalked vendors’ Instagram feeds and referenced specific posts to describe what I liked/didn’t like. How essential to you think having a planner was for your wedding day? I’m so pro-planner! 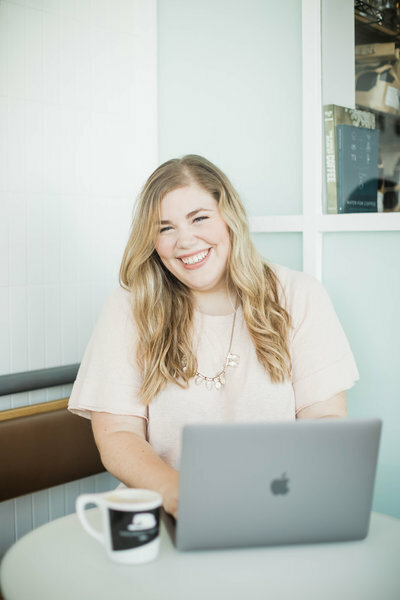 We opted for a full-service planner because when we initially started planning, I was traveling almost every week for work and wanted to put my trust in someone to manage the details for us. More than anything I wanted someone who could guide us on selecting vendors, keep our budget in check, and advise on the types of things that are worth splurging for vs. things that people really don’t notice. I still ended up being involved in every step of the planning process. 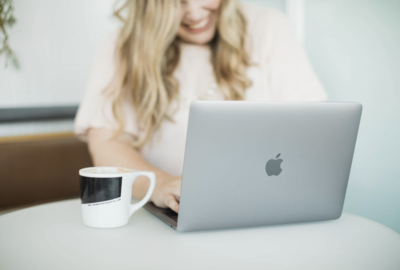 While researching planners I found that there are services out there for any level that you could want/need, from full-service, to month-of coordinators, to day-of coordination only, and the prices for each can vary greatly. So if you don’t think you need a planner or don’t want to spend your money that way, I would still advise researching your options because you definitely at least want someone to be the point person on the wedding day! We had a make-your-own s’mores bar as a late night snack! I saw this idea on pinterest very early on and immediately knew we wanted to have it, and luckily it was something our caterer offered! What did you find most surprising about planning a wedding? And most challenging? Even with a relatively short timeline (~9 months), the planning itself felt manageable, especially because we had a planner. I somehow thought the whole thing would be much more busy and stressful! The most challenging thing by far was staying within budget. We started out with a budget we both felt comfortable with but had some wiggle room. The things you book at the beginning are some of your most expensive (venue, planner, photography, catering…) and you typically put down a deposit to reserve your date. Since it’s early, we assumed “oh, it’s okay if we spend a little more in this category, we can just cut back in other categories later.” A few months down the line, we realized we were going to go over our budget, but there weren’t really any big things we could cut out, since we’d already put down deposits. We ended up cutting some things that we had initially wanted to include to help keep costs down, but we did still go over budget more than we wanted to. However, I was extremely pleased with all of our vendors and the day as a whole, so in the end it all felt worth it. Now your path to the perfect dress was gradual! Tell us about your dress, from buying it to how you felt in it on the day. Where you surprised with the dress you ended up chose? I was travelling to New York City regularly for work, and was staying there over the weekend and having a friend visit. On a whim we decided to see if there was anywhere I could go try on dresses last minute…it was Friday afternoon and I hadn’t made any appointments. The only place we could find that had an opening was a bridal consignment shop. Of course, this meant that if I loved something, there was a risk that it wouldn’t still be there if I waited to buy it! I told myself that the goal was just to see which styles worked well on my body. I tried on several dresses and really loved one in particular, but didn’t feel ready to buy without my mom there. By Sunday, I couldn’t stop thinking about that dress! I called my mom in a frenzy and explained how I was feeling, and without hesitation she said “Well if it’s the dress, you need to get it! !” So I literally hopped in a cab and showed up at the consignment shop, without an appointment, hoping that the dress was still there and they’d let me try it on again. Luck was on my side and after putting it on again, and several Facetime calls to family and close friends for approval, I bought the dress! They were able to ship it to Austin and I had it altered here in town, and it was perfect! What is the one thing you’re glad to have invested in for your big day? This is random but, shuttles for guest transportation. It wasn’t cheap, but most of our guests were staying downtown, while our church is in North Austin. The reception was also downtown. It was important to us to make it easy for guests to get to and from all of the different locations, especially with so many people traveling from out of town and not being familiar with the area, we felt it was the least we could do! What surprised you most about your wedding photography experience? Any photography-related wisdom you’d like to pass along to other brides? The thing that surprised me most was how quickly we got our wedding gallery back! 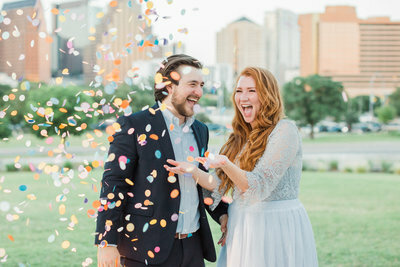 It was seriously SO much faster than expected, which was wonderful since we were still on cloud 9 and had so much fun reliving the day through the photos. We took our time viewing the gallery together for the first time and that in itself was another memorable experience. We loved getting to see moments that we didn’t get to see in person, since it’s impossible to be everywhere at once! My photography-related wisdom is to find a photographer that captures the “vibe” you’re going for on your wedding day – for both the couple and the guests/party! At first I thought all wedding photography kind of looked the same, honestly, and I found it hard to decide between various photographers. The more I looked, the more I realized that I was drawn to the ones where the couples looked natural and at ease, in love with each other, and having fun with their guests. I also liked bright, light-filled photos. There are certainly other styles that go for a more posed or editorial look, or more muted tones, which totally fits some couples, so it’s just personal preference. How did you decide your honeymoon plans? Our criteria was basically – somewhere warm/tropical, relatively easy to get to, and where we could redeem hotel points. We ended up settling on Hawaii even though we’d traveled there before together, because we loved it and felt there was still so much more to see! We also timed it right before the holidays so that we could still be back home to enjoy Christmas with our families. Pure bliss! We felt that the day could not have gone any better, and we really got to enjoy every minute of it. We did not feel rushed and everyone had a great time. We were so grateful that so many of our friends and family traveled to celebrate with us – if only we could have spent more time with everyone during the weekend! We did plan a day-after brunch gathering the next morning (read: breakfast tacos) so we got to reminisce with everyone and say goodbye before our guests left town. The small stuff adds up quickly, so opt for budget-friendly options where you can! For example, we saved hundreds of dollars on our invitations using a bargain site instead of one of the more popular wedding stationery sites, and they still came out great. I love high-end stationery, but ultimately we decided that we would rather put that money toward the experience of the day itself. Thank you for sharing your real wedding planning advice, Marianne!! I’m so sad our work together is over for now, but thankfully we get to be friends forever, right?! 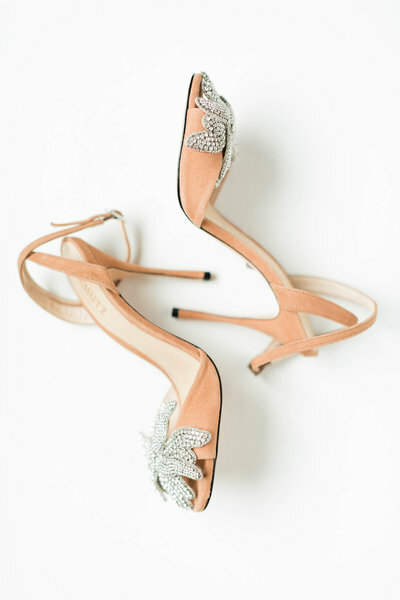 Looking for more real wedding planning advice? Check it out here!! Loved the blog, Paige! Marianne and Steve threw an outstanding wedding and your photography was exceptional! Kudos to all the vendors also!